Choosing the best of two worlds...The Boy Who Wanted to be a Bear. Some people limit themselves rather severely when choosing what kind of movie they want to watch. Some prefer to watch only science fiction films, whereas others are action buffs through and through. Similarly, there are people who refuse to watch animation because they maintain the close-minded belief that animation is exclusively for kids. Most members of the anime fan community are conscious of this common misconception concerning animation. Manga enthusiasts see the same thing quite often, for comic books are subject to the same stigma of immaturity associated with animation. What’s interesting to note is that even within the society of those of us who appreciate animation and manga, there is a similar sort of bias. I can clearly say that there’s a difference between Japanese animation and American animation, just as Korean comics have systemic, as well as stylistic differences from manga from Japan. However, this difference is not one of quality, but rather one of culture. Not all animation from Japan is superior to works produced elsewhere, just as not all manga is more worthy of reading than American, Chinese, or Korean comics. While I clearly have respect for all things Japanese (except sushi, surprisingly), and while many of my all-time favorite animated works come from Japan, I can appreciate anything that has a good story, regardless of origin. And that brings me to the subject of a recent release from Central Park Media -- The Boy Who Wanted to be a Bear. From the production crew that helped to create The Triplets of Belleville, this particular release is unlike any other animated release that I’ve seen in Japanese, English, or whatever your language of choice may be. Originally created in French, The Boy Who Wanted to be a Bear includes an English dialogue track, as well the original language version. 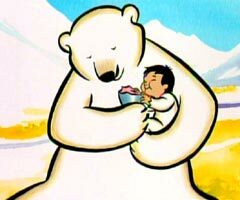 The imagery in The Boy Who Wanted to be a Bear gives the film a look appropriate for a classic children’s tale. Occasionally, CG effects are used to add depth to the visuals, but most of the movie’s scenes look like individually painted works of art. It’s a very interesting way to show a story, and for a tale with so much of a kinship with ancient myths, it is quite appropriate. Set in the harsh North, the story begins from the perspective of two polar bears as they desperately try to escape a pack of hungry wolves. 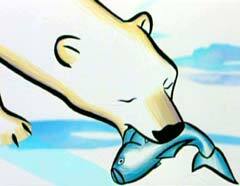 Polar bears are the world’s largest land predators, but they have two significant disadvantages against the wolves. First of all, there are far more wolves than bears. More significantly, however, the female bear is pregnant, and thus cannot move as fast as she could while unencumbered. The bears eventually escape the wolves, and the female bear goes into labor not long after the incident. Sadly, possibly due to the trauma of the wolf attack, the baby cub is stillborn. Depression quickly overtakes the mother-to-be. She refuses to eat or move, and her mate begins to worry that she will let herself die. Displaying an uncharacteristic amount of concern for his mate (polar bear males don’t usually stick around), the father of the lost child wanders to the nearby dwelling of a human hunter and his wife. As luck would have it, the humans also just had their first child. When the male bear approaches the one-roomed house, the father of the boy is off hunting, and the mother is far enough away that she does not notice the bear enter their home. 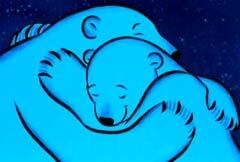 The bear decides to take the boy to replace the child that his mate was unable to successfully birth. The boy’s mother comes home just in time to see the immense animal cradling her child in its arms, but despite a fierce attempt to keep the bear from taking the boy, the male bear easily knocks her aside and returns to his mate. Her depression is quickly dissolved by her maternal instincts, activated when the boy is taken to her. In this story, as within many animated features, the animals are anthropomorphized. They exhibit human-like concerns for their offspring (or in this case, the mother bear’s adopted offspring) and have the ability to speak amongst themselves, if not with humans. 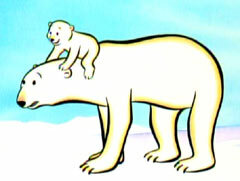 Well, all humans except for the boy, raised by a polar bear. The female bear does indeed protect, feed, and educate the boy in the ways of the natural world. Not long into his bear-life, he begins to become acutely aware that he is not the same as other members of his adoptive species. He can have fun with other bears, but he is noticeably weaker, smaller, and more susceptible to the cold environment than his fuzzy playmates. Perhaps his most reliable companion is an alternately sagacious and mindless crow. The crow was responsible for convincing the male bear to steal the child from the humans in order to save the life of the female, and thus he looks out for the boy in his own (albeit bird-brained) manner. Given the title of the film, most people would guess that the boy prefers his life as a bear to anything he could ever think of as a human. However, the title doesn’t merely refer to the boy’s wish that he could have been born a bear instead of a man. It is, in fact, a quest. Legend has it that the spirit of the mountain has the ability to grant wishes, given the satisfaction of specific requirements. The boy believes that it is possible to be transformed into a real bear, to no longer be shackled by the heritage of humanity. The end result of this production is a story that feels mythical and timeless at the same time. It isn’t didactic, as many children’s tales tend to be. Instead, it comes across as more of a folk tale than as something meant to teach a lesson that children ought to learn. The Boy Who Wanted to be a Bear is not anime if your personal definition coincides with mine. That is, for me, the term anime is reserved specifically for animation from Japan. It is a much-contested subject, the definition of both anime and manga, but one that is silly to debate. Both definitions can coexist, and the important thing is to understand the contextual meaning of the word. If a person in Japan says "anime," he or she is referring to animation of no particular cultural origin. If I say "anime," I mean Japanese animation. Other people use the term in various shades of these two meanings, just as "otaku" is an almost derogatory term in Japanese, whereas over here, many people wear it as a badge of pride. As I was saying, this film is not Japanese, though it wouldn’t be the first time CPM brought over foreign animation from somewhere other than Japan. Last year’s charming (though odd) classic Korean children’s story, Doggy Poo, was a definite departure from normal animation. First of all, it was crafted using stop-motion animation, but then, it was also different due to the fact that it was a story of a contemplative piece of dog feces questioning its own existence. This isn’t quite as surreal as Doggy Poo -- few things are -- though it is similar in the way that it is an intimate look at the mythological foundation of another culture. Storytelling is an integral part of human history, and much can be inferred about a culture by listening to the works of fiction it produces. Perhaps I’ve spent too much time reading the works of Walter Ong (check him out if you’re interested in learning more about the significance of humanity’s oral storytelling heritage), but whether I’m biased towards folklore or not, I’m really glad that CPM is trying to broaden the horizons of the current anime fanbase. The Boy Who Wanted to be a Polar Bear won’t win as much recognition as The Triplets of Belleville, but nonetheless, it’s a film to keep an eye on. As a fan of all animation, I’m interested in seeing how well CPM’s experiment with non-anime releases works out.